Close enough to see the reflection in his eye! Quite a closeup! It might benefit from a little extra PP but still a great picture. I love the unusual feather configuration. Great Capture. Nice sharpness. The effect on the feathers aginst the muted OOF background is really wonderful. Wow, you have captured some fabulous detail in this bird of prey. The feathers take on the appearance of spikes for the way they jut out and adorn the bird's head. Great sharpness on the eye - nice and clear that we can gaze into the eyes of this hunter. My only thoughts/critique is that I wonder if you could have accomplished even more of a bokeh effect (larger aperature) with the backdrop without sacrificing the sharp detail in the bird. The lines on the backdrop run counter to the bird of prey's feathers and it a touch distracting. 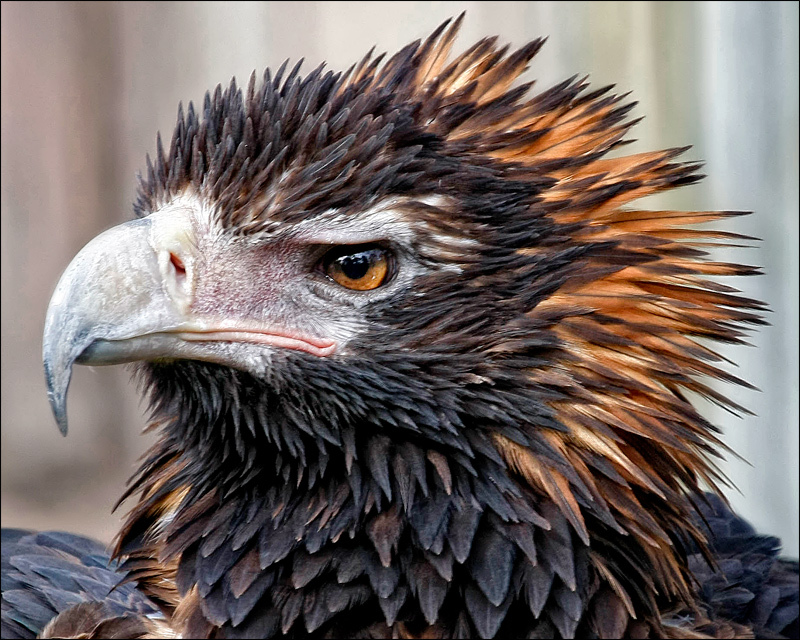 Don't know for sure, but I imagine this eagle would be a LOT madder than a wet hen. Proudly hosted by Sargasso Networks. Current Server Time: 04/22/2019 04:20:47 PM EDT.